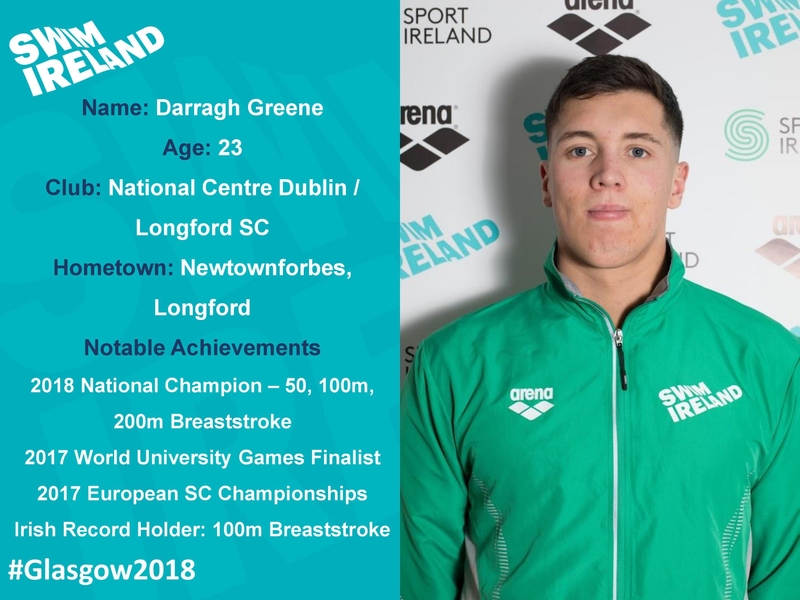 Longford's Darragh Greene is bidding to become the first Irish swimmer to break the minute mark for the 100 metres Breaststroke at the LEN European Championships in Glasgow. Darragh, from Newtownforbes, who swims out of the National Centre Dublin and Longford Swimming Club, set a new Irish record of 1:00.21 in the 100m Breaststroke at the Irish Open in April. And he certainly has the potential to be the first Irish swimmer to break the minute mark when he takes to the blocks alongside Alex Murphy in the event on Friday. The LEN European Championships in Glasgow get underway on August 3. The meet will also act as an opportunity for swimmers to pre-validate* (see EXPLAINER at end of article) their place on next year’s World Championships team. The European Championships will see almost 1,000 participants compete in the aquatic events with 47 nations and 43 titles in swimming and 23 nations competing in 13 events in Diving. Rio 2016 semi-finalist Shane Ryan gets the Championships underway for Ireland in the 50m Backstroke preliminaries. Ryan will have high hopes in the event where he took gold at the 2017 World University Games. The 24-year-old, ranked fourth going in to the heats, will be joined by Conor Ferguson, attending his first European Championships as a senior athlete. Ireland’s 4 x 100m Freestyle Relay will see with Ryan, Jordan Sloan, David Thompson and Robbie Powell combining for the first time in an international event. Swim Ireland National Performance Director Jon Rudd commented, "With the European Championships almost upon us we are very excited to see how this team will feature amongst some of the best swimmers in the world, particularly as our team is a mixture of youth and experience." Rudd added, "Day 1 is an exciting day for us with Shane Ryan, Conor Ferguson, Darragh Greene and Alex Murphy starting their campaign, as well as our men’s freestyle relay. We believe that we have some strong relay chances alongside some quality individual athletes too. It’s only 20 months to our Olympic trials and our swimmers must be preparing themselves now, physically and mentally for that. Over in Edinburgh we have Oliver Dingley spearheading our small but talented group of divers as they start their campaign too." Team Ireland divers will get their campaign underway on Tuesday, August 7 with Oliver Dingley and Jack Ffrench competing in the 1m Springboard Preliminaries. *Via the 2019 FINA World Championships Selection Policy, athletes have been set a time in each event which, if achieved at the 2018 European Championships, would pre-validate them for selection to this Championships next summer. Such athletes would still need to attend the 2019 Irish Open (Trials), but the time required at the Trials to formalise their place on the National Team for the World's would be much less demanding than the time required should they not achieve this in Glasgow.